Cauliflower is becoming a miracle vegetable in our house. We’ve made pizza dough, mashed potatoes, cheese bread and now stuffing out of it! This recipe is from Delish, a website devoted to recipes. I have the link at the end, but their site doesn’t include the nutrition info I’ve posted below. We LOVE this recipe! Add cauliflower and mushrooms and season with salt and pepper. Cook until tender, 5 to 10 minutes more. This is amazingly tasty, and we had it with turkey and cranberries. It is a really good side dish for poultry, pork or even fish. Give it a try! Nutrition Info (provided by T2T, not on the original website) shows that at 15 net carbs, this is a huge win compared to regular stuffing! 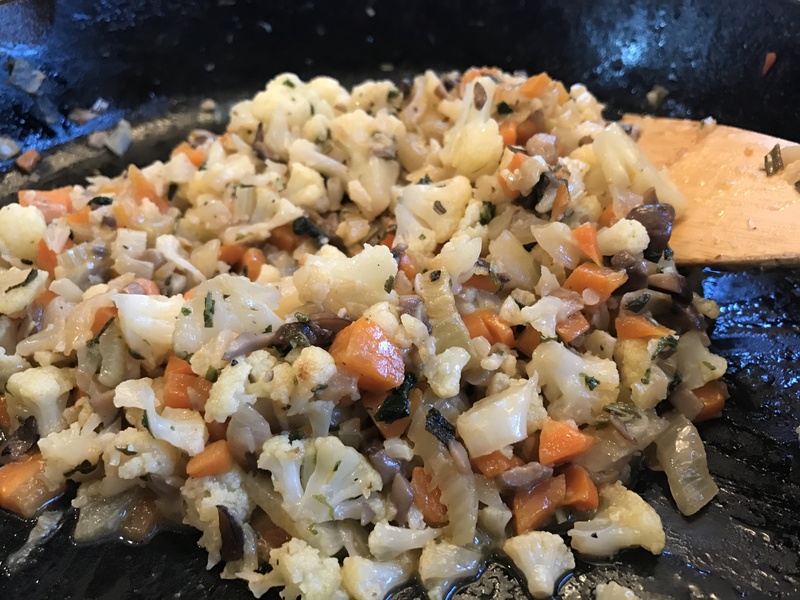 (Regular stuffing is approximately 25 net carbs because of the lack of fiber). I made this as the side dish I could eat for Thanksgiving. It’s a really good recipe that I’ll put into my regular rotation. Even my carb-eating guests liked it!